Yup! You earned those points and the plot can no longer be done, so feel free to use them up and send the items to your main if you wish. Just remember that the trophy and theme will remain on that account. Those can't be moved! It's usually one person, but different people have been responsible for writing them over the years, if that makes sense. As we said last week, people can play as much or as little as they want for their own personal stats, and there is no such thing as playing "too few games" and hurting your team. Any games you play will help! Once you activate a cookie, the timer starts and runs in real time. So, for your lab ray cookie, you'd need to visit seven days in a row to make sure you didn't miss any extra zaps. We looked into it, and apparently the correct tail is displaying; it's just the way the image is cropped that makes it look like a Gelert's tail. We can understand your confusion! A glitch? Sorta. We originally meant for the avatars to act as you expected, but from the beginning they were swapped. (Male Korbat gets granted to female users, and vice-versa.) While it wasn't our intention, so many people had already been awarded and it was left it that way. (Also, it's a pretty funny mix-up.) So, that's they way it's been for many, many years. Also, once you get one, you can't get the other. "Since the 5th Neopet feature is only for Premium members, you will not be able to keep the 5th slot if you cancel. Once your subscription expires, you will need to abandon or transfer one of your five Neopets to go back down to four. You can select which Neopet this is -- it does not have to be the one in the 5th slot. If you choose to abandon, we will hold that Neopet for 90 days before releasing it to the Neopian Pound. (We don't want to put it in there immediately, just in case you simply had billing issues or decide to come back to Premium right away, etc.) After 90 days, it goes into the Pound to be adopted by a new owner." Yup, it's okay to get creative with perspective and all of that good stuff. :) Just make sure that the narrator is a natural denizen of Neopia, and not your human self. Make sure you select the regular version of the game, rather than the large. There can also be complications if you choose to view web pages in a larger font. Try resetting that to default and see if it helps, too. If not, please send a bug report so we can try to help you with the issue. :) Be sure to include a screenshot! We don't usually respond to the Happy Thoughts. If we did, our eyes would get all puffy from happy tears and then our coworkers would think we've contracted some zombie plague and bad things could happen. It's really for our own safety. 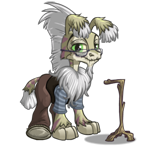 A baby Kacheek is found on the pound's doorstep. Who can help her?